Crystal Cruises has put forth an offer no sushi lover (like myself) can possibly resist. 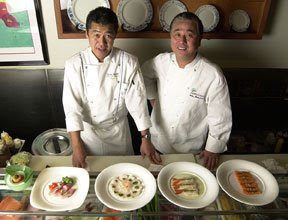 Famed Chef Nobu Matsuhisa (called one of America's 10 Best Chefs by the LA Times) is joining guests aboard Crystal Serenity’s July 28 Mediterranean cruise with stops in Venice, San Marino, Corfu, Rhodes, Bodrum, Istanbul, Mykonos & Athens! Besides creating a week of menus exclusively for Crystal Cruises guests as well as omakase (chef's choice) menus in the ship's complimentary Silk Road Restaurant Nobu will be interacting with guests during culinary demonstations, cooking lessons and book signings. Fares start at $6,055 per person, double occupancy for this special Nobu-inclusive sailing. PLUS, Elite Travel International clients will enjoy a $2,000 per couple shipboard credit (redeemable for spa treatments, shore excursions, shop purchases, wine/cocktails) and pre-paid gratuities! Contact us via email at elitetravelgal@aol.com or phone 310 979 9036 today for more information and to hold your spot on EliteTravelGal's favorite foodie-themed sailing of the summer season! , which holds the trademark ownership as well as the copyrights to all his images.